From the 7x world champion, the Hammerhead is Drew Danielo's brainchild. Stable, fast, and easy to stay in the wave in a package that offers maximum tech performance. The Hammerhead is the king of revert. Starting with a square nose and ending with a square tail, this board doesn't care which end is in front. The squared nose allows it to stay stable and fast when riding revert. 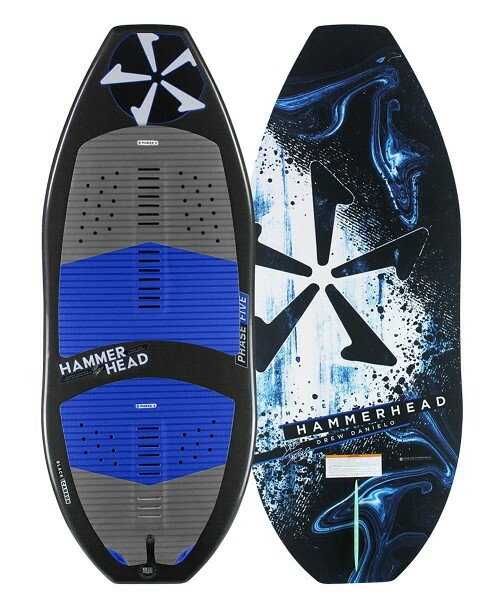 Wrapped with our carbon fiber technology, the Hammerhead stays stiff and true to shape for maximum speed and pop. The tail shape keeps you turning off your back foot like a traditional surf board. With the Hammerhead, a little luck and a lot of practice you might be able to ride like Drew. Please note: Wakesurf length choice is based on a combination of 3 key factors, rider weight, and wake size and rider skill level. Give us a call or an e-mail if you'd like some advice on which length will be the best choice for your needs.